I am the first to admit that I'm a label girl - it's probably my biggest downfall. 10 years ago at the peak of the Real Estate Market, I had no financial worries and was making more money than most 24 year old's could even fathom. Then 5 years and multiple designer handbags later, the real estate market crashed and my lush lifestyle came to a screeching halt. 5 additional years later while living in today's reality, I still carry the same designer handbags and would rather spend a little more on a pair of shoes which I can keep for 3 years vs. ones that last one season. This is why we decided to get a designer wedding flats. My Mom saw it as spending a little extra on my shoes, knowing I would wear them many times post wedding vs. a pair I would wear once at half the cost. I've been searching high and low for the perfect pair, only to receive an email the day after Christmas from Tory Burch (a/k/a my favorite designer ever) announcing 25% off their already marked down merchandise. Low and behold, they had a pair of sparkle flats in the same color as the Bridesmaid Dresses. 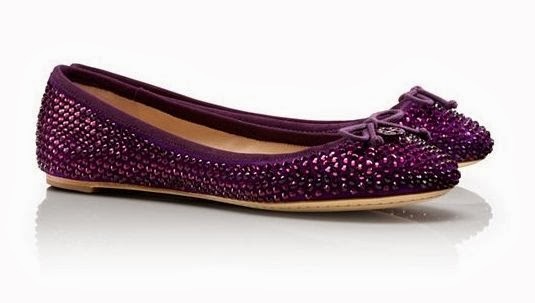 The Tory Burch Crystal Chelsea Flats seemed too perfect to be true. I did not want neutral colored shoes and I wanted something that would pop, especially being I have to wear flats. 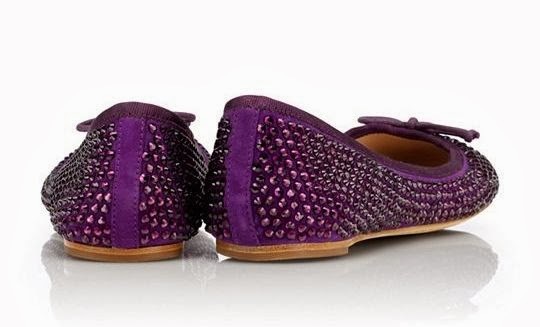 The Chelsea's were originally $275, marked down to $190 with an additional 25% off, making them $150-ish and the "Boysenberry" color seemed to match the swatch from the Bridesmaid dresses. Upon receiving them in the mail, they were a little brighter than the color swatch due to the sparkles but are perfect (and super comfortable). This is one of the benefits of having an extended engagement - most of the large purchases are already bought and paid for (this is a cash wedding - no credit! ), allowing splurges for dream wedding shoes. It is also the downfall -these purchases will overextend the budget if we aren't careful. Did you re-wear your wedding shoes after the big day? Cute shoes!! I am, what should I call it, a designer snob on a koolaid budget. I will make purchases here and there, but I can't justify spending the money on most of the items I want, fashion-wise. Now, electronics, like the iPad and iMac, I seem to have all the money in the world for, lol! I have worn my wedding shoes a couple of times after the wedding so far. But I always wear heels out and they are silver sparkley. Super comfy and goes with a lot of outfits. 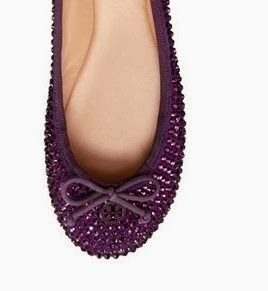 I think the Tory Burch flats are completely worth it! Love the flats! I bought very expensive shoes for my wedding, and then they didn't somehow fit right come the day of! So I wore my fave go-to pumps...and still have them. Looks like they were meant to be! I ended up wearing a pair of shoes I already owned for the wedding. I shopped for new shoes, but the ones I had were already broken in, a perfect color, and the perfect height. No new money to spend!